T-Mobile’s made no secret about boosting its B2B offerings to heighten its presence in corporate markets and of course add some black ink to the bottom line. That’s why T-Mobile is officially introducing Simple Choice for Business and Simple Choice Classic Plans. 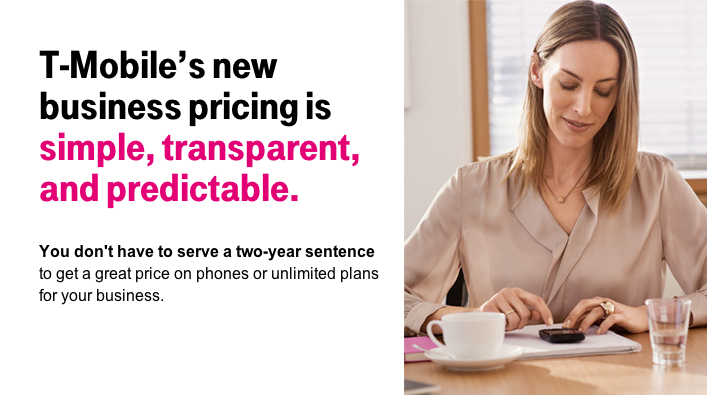 With these new plans, T-Mobile is providing business customers more flexibility and choice about how they buy and use wireless devices, including no annual service contract options with the T-Mobile Simple Choice for Business plan. Both the T-Mobile Simple Choice for Business and Simple Choice Classic plans can also help to eliminate the potential for the unpredictability, overages, and overspending typically associated with existing shared data plans from wireless carriers. T-Mobile’s Simple Choice for Business will bring the very same platform the consumer side has enjoyed since the end of March with no “restrictive annual service contracts” and the separation of the device cost and wireless service. Prices range from $20 for unlimited talk, text and 500MB of high-speed data to $50 for unlimited 4G data. As for Mobile Broadband, Simple Choice for Business and Simple Choice Classic plans with options starting at 500MB and building all the way up to 12.5GB of data. Both the Simple Choice for Business and Simple Choice Classic plans will be available on August 26th. Business customers wanting more info can hit www.t-mobile.com/business for more info. How will this help me when Im still getting only EDGE? Wonderful!! Simple Choice. If coverage is bothering you why not spend a few more $$ and JUMP to Ma Bell or Big Red or their prepaid MVNOs. They’re the most reliable and fastest 4G LTE network. No one’s forcing you stay. Simple Choice. That was awesome! Great reply. If you don’t like TMO. Leave and don’t complain. TMO isn’t for everyone. Nothing wrong with asking for better coverage. Tmobile acknowledges that. If everyone in the comments acted like they were in a TMobile utopia, it would be pretty boring. You’re right it is simple choice. I’ll probably jump to them in the near future. Then your business doesn’t need this service. Oh wait, I’m not entirely sure you were referring to your business line. I want them to expand too; they can get more customers, and people like you will stop complaining. I thought they’d been doing something similar all along. I’ve been on a Small Business Value Plan since late 2011. $35 unlimited talk and text; $10 “promo” add on for “unlimited” data capped at 5GB high-speed. Part of the deal when I got this was I had to buy a handset outright (which to be fair, they unlocked without a whimper of protest when I asked). So these plans actually look like a step back? Anyone else get the deal I did? One point you made is promotions. I remember when I first signed up with Tmobile for a talk only plan, the thing that made me choose them was a promotion. Not a free activation fee or $50 of a phone. They had a bonafide promotion on their plan which was $10 off AS LONG AS YOU STAYED ON IT. Thats where savings added up because customers like seeing a savings and a minus sign on their bill. Plus the next month when the price went back up to normal, I and the others who signed, felt like they were really saving money (as opposed to fake sales or retailers that raise the price and then mark items down). paying well over $1k for an iPhone 5 and a Samsung S4 without Windows Phone and BlackBerry, so think twice before bashing them just for the sake of it. I do not need an app for that!!!!! My phone is just an annoying business tool. For all small business guys (less than 6 lines) the new plans are the same as Consumer plans. Better to stay on the current Small Business Value plans instead of jumping to the new Small Business plans. The new B2B plans benefit only if you have more than 6 lines. At least that is what I could make of it, unless someone can provide evidence that the new plans work for small business as well.